Managua, in Nahuatl, means where there is a big water extension¨; for the many lakes and lagoons that surround it. Managua is the center of an ancient volcanic system it´s located on the southern of the lake of the same name. Of elongated shape, the city extends over 20 kilometers along the lake to the south to reach the Sierra de Managua (600 m) and has more than 1,000,000 inhabitants. Located at an average of just 50 m above sea level, dominates a hot and humid climate, with temperatures averaging between 28 and 32 Celsius degrees, reaching 38 degrees in the warmer months. The months of December and January are the coolest of the year, March and April the warmest. Winter is between May and December. 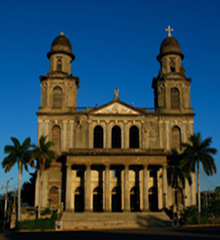 Managua is a city in constant change, before the earthquake of 1972 was a cosmopolitan city of the most important economy in the region, but this catastrophe plus the devastating period of war in the 80 severely affected the development. Since the 90s, with the War period in the past, the city has been slowly rising, there are important commercial and industrial centers and is the economic center of the country and government. Despite being the capital, it doesn´t have the character of colonial city, because was elevated to capital until 1852, compared with Leon and Granada which ones were diplomatic capital in the past, and their history as been most important to country. As attractions are its historic center, the Old Cathedral, the Palace of Culture, the Ruben Dario National Theater, the Peace Park, the ride Tiscapa Hill. The city Is the axis of connection between the other cities. You can enjoy the exciting nightlife and its range of cultural activities held throughout the year, such as the traditional festival of Santo Domingo in August, Carnival Alegria por la vida, schools band marches, Latin Music Festival, as well as concerts of important national and international artists.